I am finally completing my “responding to the critics”- answer to Keith Mathison. Well, I actually began this response all the way back in 2016, but, got side tracked somehow. As I was going through some files just this morning (4-21-18) I discovered my oversight and failure to finish posting my response to Keith Mathison. So, with apologies for the delay, here is installment in our Responding to the Critics series, answering Keith Mathison. Be sure to read the first two installments #1 #2. Mathison’s self contradictions, lack of logic and theological error is brought home in the fullest way when we examine his views of Revelation. Commenting on Revelation 11:15f, Mathison affirms: “The kingdoms of this world have become the kingdoms of our God and of His Christ” (Keith Mathison, Dispensationalism: Rightly Dividing the People of God? (Phillipsburg, NJ, P and R Publishing, 1995)112. Do you catch the power of what Mathison has said? Let me present it in simple form. The time when the kingdoms of this world would become the kingdoms of God and of His Christ is the time of the resurrection, the time of the judgment of the dead and rewarding of the prophets (Revelation 11:15f). But, the kingdoms of this world have become the kingdoms of our God and of His Christ (Mathison). Therefore, the time of the resurrection, the time of the judgment of the dead and rewarding of the prophets, has been accomplished (i.e. Fulfilled). This is logically inescapable and means that Keith Mathison must believe that the resurrection is passed! And make no mistake, just like true preterists do, Mathison posits the fulfillment of Revelation 11 at AD 70: “In fulfillment of the prophecy of Daniel 7, the events from the resurrection and ascension of Christ to the destruction of Jerusalem mark the inauguration of the kingdom of Christ (Matthew 28:18; Acts 2:36)” (From Age to Age, The Unfolding of Biblical Eschatology, Phillipsburg, NJ, P and R Publishing, 2009)676. We must ask: Do the dead of Revelation 11 include Abraham, Isaac, Jacob of Hebrews 11? Is the resurrection, judgment and rewarding of the dead in Revelation 11 the time when Abraham received his reward? If so, then this means that the better resurrection of Hebrews 11 was fulfilled in the sounding of the seventh trump– in AD 70! But, if this is the resurrection of Hebrews 11 then the OT worthies have indeed fully entered into their reward. But remember that they could not receive their reward without and before the first century (Christian) saints! This is prima facie demonstration that to affirm– as Mathison does– that Revelation 11:15f is fulfilled is to affirm that the resurrection is past. Mathison’s confused and confusing theology becomes more entangled. The sounding of the seventh trump– in fulfillment of Revelation 10:6-7– was the time of the fall of Jerusalem (Mathison). But, the sounding of the seventh trump was the time of the resurrection, the time of the rewarding / judgment of the dead (Revelation 11:15f). Therefore, the time of the fall of Jerusalem was the time of the resurrection, the time of the rewarding / judgment of the dead. Mathison compounds his confusion on Revelation 10-11. Commenting on Revelation 10:5-7 he says: “Then the angel raises his right hand to heaven and swears that there will be no more delay, but that the mystery of God will be fulfilled just as God announced to his prophets (v. 5-7). This passage clearly echoes Daniel 12:7. The implication is that the final period of history predicted by Daniel has now arrived” (2009, 673). So, on the one hand, the sounding of the seventh trump– the time of the judgment and rewarding of the dead of Revelation 11:15f– has been fulfilled. On the other hand, the sounding of the seventh trump will not sound until the end of human history! This is a glaring, irreconcilable, inescapable logical contradiction. You cannot affirm on the one hand that the sounding of the seventh trump was fulfilled in AD 70, and then turn around and say that the seventh trump will not sound until the end of human history! This approach is a major violation of Mathison’s comments in regard to the trumpets. In his comments on the trumpets (Age, 2009, 671f), Mathison links the blowing of the previous six trumpets to the events surrounding and leading up to the fall of Jerusalem in AD 70. He is clear and unambiguous on this. So, we are to believe that the six trumpets were all fulfilled in the first century, in the Jewish War of 66-70. But, we are to believe that the seventh trumpet has not yet sounded, and will not sound until the end of human history. This in spite of the fact that Mathison tells us that in fact, the seventh did sound in the fall of Jerusalem (Revelation 11:15f), when the kingdoms of this world became the kingdoms of our God! So, Mathison inserts a gap of so far 2000 years between the sixth trumpet and the seventh (shades of Millennialism! ), in Revelation 10. (It is abundantly strange that we are witnessing an increasing tendency among some “reformed” commentators. For instance, Sam Frost has now taken the position that there is a so far 2500 year gap in the period at the end of Daniel 12:1 and the promised resurrection of Daniel 12:2! He says that verse 1 refers to the time of Antiochus Epiphanes, while verse 2 is yet to occur at the so-called end of time. This “gapology” theology is truly full of holes! Back to Mathison: he affirms that the seventh trumpet was blown in AD 70 (Revelation 11:15f– thus affirming that the resurrection is past). This is the nature of Mathison’s confused theology. You simply cannot logically affirm the fulfillment of the seventh trump and then turn around and say it has not yet blown.Such self contradictory positions makes our task of Responding to the Critics extremely easy! Let me note now Mathison’s glaring self contradictions in regard to Daniel 12 and the resurrection. Mathison claims that the resurrection of Daniel 12:2 will occur at the end of human history. He likewise says that the sounding of the seventh trumpet in Revelation 10:6f, “This passage clearly echoes Daniel 12:7. The implication is that the final period of history predicted by Daniel has now arrived” (2009, 673). So, per Mathison, Daniel 12 foretold the end of time resurrection of the dead. Oh, but wait, Mathison believes, as just seen, that Revelation 10:6f was fulfilled in AD 70! And that is not all. Mathison comments on the New Creation and Revelation 22:10: “Do not seal up the words of the prophecy of this book, for the time is near” (v. 10. The words here are in direct contrast to the words spoken by the angel to Daniel: ‘But you, Daniel, shut up the words and seal the book, until the time of the end” (Daniel 12:4). At the time John writes, the time of the end has drawn near” (2009, 695). On the one hand, Mathison tells us that Daniel 12 foretold “the time of the end,” the “end of time” resurrection. On the other hand, Mathison tells us that “the time of the end” (the time of the resurrection), foretold by Daniel was near when John wrote Revelation. No amount of verbiage can mitigate these self-contradictory positions. Mathison affirms that the fulfillment of Daniel had drawn near when John wrote, and then he affirms that Daniel will not be fulfilled until the end of time! Which is it? It most assuredly cannot be both. To affirm that the fulfillment of Daniel was near is to affirm that the resurrection of Revelation 20– at the end of the millennium- was near. This is irrefutably true. Incidentally, there is now a (growing) contrast between Mathison and Gentry. Gentry once agreed with Mathison’s view that Daniel foretold the end of history resurrection. Now, however, Gentry has adopted the true preterist view that Daniel 12 was fulfilled in AD 70. Oh, but wait, Mathison has now taken that same position in Revelation 22, although he says Daniel 12 is the end of history when commenting on Revelation 10! See my audio critique of Gentry’s latest tome. The critique is a devastating exposure of Gentry’s self contradictions. The audio is available from me on my websites. There is, a very clear and dramatic difference between Mathison and Gentry in regard to Babylon in Revelation. Gentry says Babylon is Old Covenant Jerusalem. Mathison once held this position (Hope, 153), but now claims that Babylon in Revelation was Rome. Another interesting, and not insignificant, difference between these two major players is that Gentry is emphatic that a “distinctive” of the postmillennial view is that the end is not imminent (Dominion, 2009, 343). On the other hand, Mathison, although he insists that we honor the NT statements of the temporal imminence, applying them to the AD 70 parousia, nonetheless also affirms that the final coming of the Lord must be considered as “always imminent” (Age, 2009, 638). It is fascinating to witness this ever changing face of “postmillennialism.” The developing differences between the major players is significant, and yet they all claim to represent creedal orthodoxy and true postmillennialism! But, let’s continue, shall we? We will continue and conclude in our next article. I do apologize for the long delay in continuing, but, I got involved with other projects! For more of the Postmillennial confusion on eschatology, get a copy of my formal debate with Dr. Joel McDurmon, who is now president of American Vision, in Powder Springs, Ga. He and I engaged in July of 2012, and a book of that debate is available from me, Amazon, Kindle and other retailers. But, you probably can’t find it listed on their website, at least I could not find it the last time I looked. 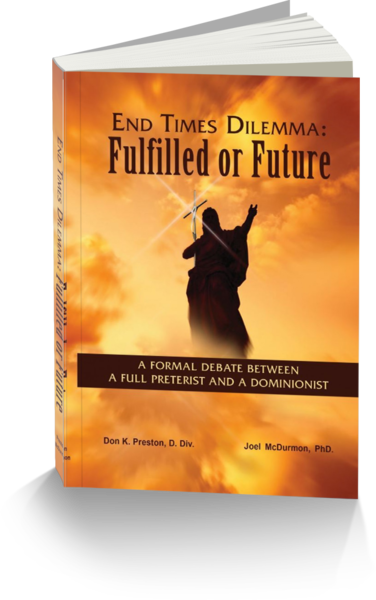 McDurmon Preston Debate- This book powerfully exposes the un-Biblical nature of Postmillennialism. Previous Previous post: The End is Near – Again! — NOT!